Hartpury go into Week 26 of the National League 1 season, safe in the knowledge that their grasp on the title is secure, but equally determined to ensure that there is no let-up in the standards that they have maintained throughout the campaign. Saturday’s opponents, Darlington Mowden Park, were on the wrong end of a 74-0 trouncing when they visited the Gillman’s Ground back in mid-November although, coming on the back of five successive defeats, that was definitely the low-point in their season. Since then, they have steadied the ship considerably and now sit comfortably in mid-table, far away from the pressures of being in the relegation picture. 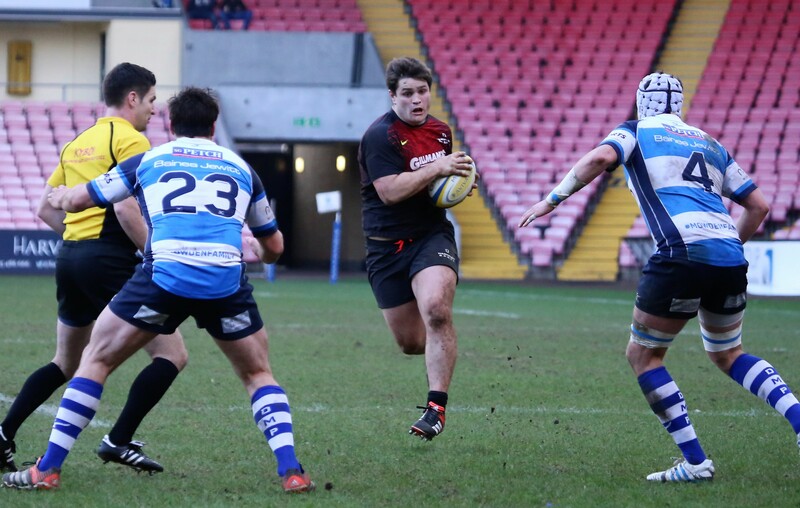 In that time, wins over Birmingham Moseley (away) and Ampthill have shown that they are more than capable of upsetting the leading sides, which makes them a dangerous proposition, according to Hartpury’s Director of Rugby, John Barnes. Last season’s excursion to the cavernous Northern Echo Arena ended in a 36-27 defeat (James Stephenson, pictured in that match). Despite a bright start – which produced two early tries – and a strong finish, Hartpury were beaten by the better side on the day. How does the coaching and management challenge change, now that promotion is in the bag? Looking further ahead, and with the benefit of promotion being confirmed relatively early, are there any significant changes planned for next season? The short break has given most of the squad time to shake off any little niggles and Barnes is not expecting many changes to the starting line-up for Saturday’s match. Hartpury also have a high-profile BUCS (Universities) Super Rugby final at Twickenham next Thursday, which may influence the eventual selection, expected to be made at the end of the week.